Income condo in paradise!! 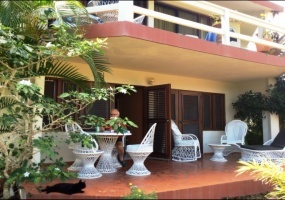 !This stress free condo is located on the green hills of La Catalina , 5 minutes from Cabrera.It’s the ideal place for those looking to come to the island many times a year and when you are not here you have the hotel La Catalina rent it for you. By doing this all the maintenance fees are paid and you make extra money also. INVESTOR! 20% ROI. Own All 6 New Oceanview Apts.All 6 New fully furnished Townhouse Apartments for Sale. Ready for Vacation Rentals near new Ocean Promenade (US$80 daily-$350 weekly-$600Monthly)Cabrera on the North Coast of the Dominican Rep is an ex-pat haven. Friendly people. Quiet safe and mellow complete small town.Near 10 beautiful beaches. Villa overlooking the beautiful Playa Grande Golf Course & spectacular ocean views! !This stunning ocean view property is located on a hill, high above the beautiful Playa Grande Golf Course and Playa Grande beach. 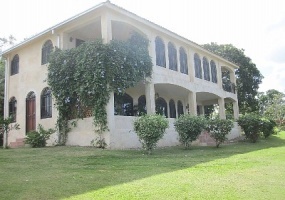 This house is a compact Spanish type hacienda design in a group of 5 other properties. Excellent house just a few meters from the ocean!! !This house was built to last, very solid and secured with its stoned wall surrounding the whole property. Located just steps away from the ocean and a natural swimming pool with clear water.It also has a pool, garage, large terrace. 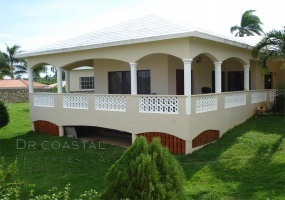 A true Caribbean house!This house offers the true Caribbean experience with its wonderful cana roof and the wide ocean view making it very desirable place for living. * 3 bedrooms, 2.5 bathrooms* Fully furnished* Satellite TV* High speed internet* Pool* Generator and inverterOnly 10 minutes from Playa Grande beach & Golf course, 5 minutes from town and 40 minutes from El Catey airport. Two brand new beautiful houses for the price of one!!! !This property has houses of 2 bedrooms & 1.5 bathrooms each. It\\\'s located on La Catalina Hills surrounded by a green tropical forest with a small river. * Amazing landscaping* Electricity* 3.5 inverter, 8 batteriesNew paved road will start building on June.15 minutes from Playa Grande beach & Golf Course. Great family home!! !This house is located in the small town of La Catalina in a very peaceful area, the house was recently renovated and perfect for a family. Nice comfy house , Very affordable! !This cute little house is perfect for those people who want to spend some time in the island and could be rented when you are not using it. It has a nice size yard with many fruit trees, a small river runs by the front and side of the house and it is only minutes away from more than 15 different exotic beaches. Spacious house on the hills of Cabrera!!! !This beautiful home has large balconies overlooking the blue atlantic ocean , it also has a spacious living room, dinning room, kitchen, 4 bedrooms, storage room, nice gardens and a strong stoned wall surrounding the whole perimeter.Very peaceful, you only need to bring your family. This Caribbean Oceanside Villa is a luxury family holiday home, situated in the North Coast of the Dominican Republic and within a stone's throw of Playa Grande Beach and Golf Course.On the rock at Amazing Bay, surrounded by a wildlife sanctuary - an uninterrupted view of Deep Blue Water, this elegant house extends over 2 floors and provides generous accommodation for up to 8 persons. Amazing Villa at a even more amazing low price!! 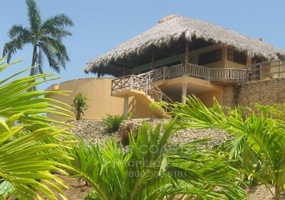 !This Villa is located on a high cliff in a gated community with a spectacular panoramic ocean view. It spreads out in 5 buildings through out the property. * 5 bedrooms, 5 bathrooms* Pool and Gazebo* 2 car electric garage* 2 solar water heaters* Office* Laundry room* High walls around the property which make the property very safe and peaceful. Appealing ocean view villa!!!! 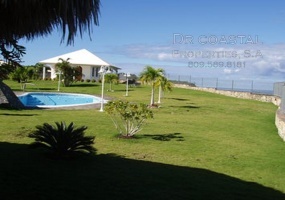 This well built European style villa is located on a high hill overlooking the vast Atlantic Ocean and the beautiful town of Cabrera.Features:3,097 land meters420 mts construction sq meters6 bedrooms with 4.5 bathrooms.Large balconiesIndependent maid\'s quarters.2 car garage Vibrant multi-colored gardensPool & spa.Gazebo.